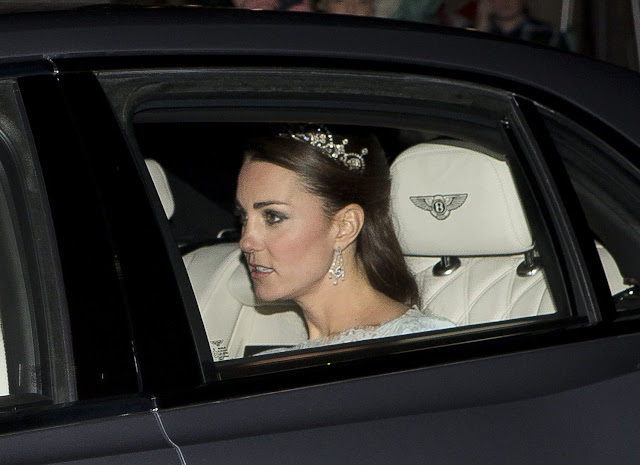 Let’s start off with Kate’s tiaras! 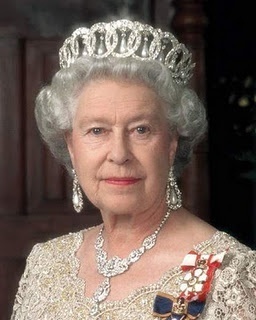 Tiaras are usually life loans which means she keeps them until she passes away,divorces, or a change in rank. By a change in rank I mean it is possible that when she becomes Princess of Wales and eventually Queen, some of her tiaras will go back into the vault for rotation again since she will have access to bigger tiaras. 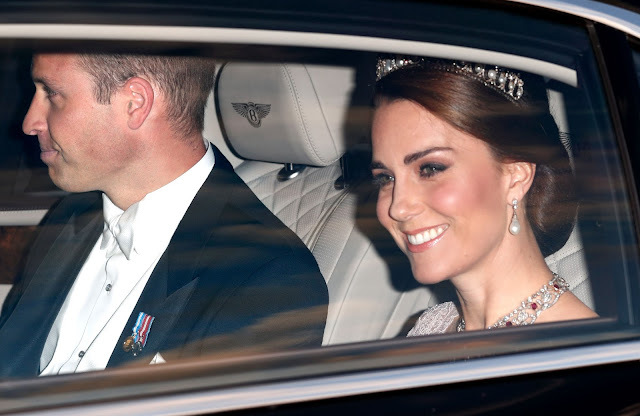 The Cartier Halo tiara was Kate’s first tiara which she famously wore on her wedding day in 2011. 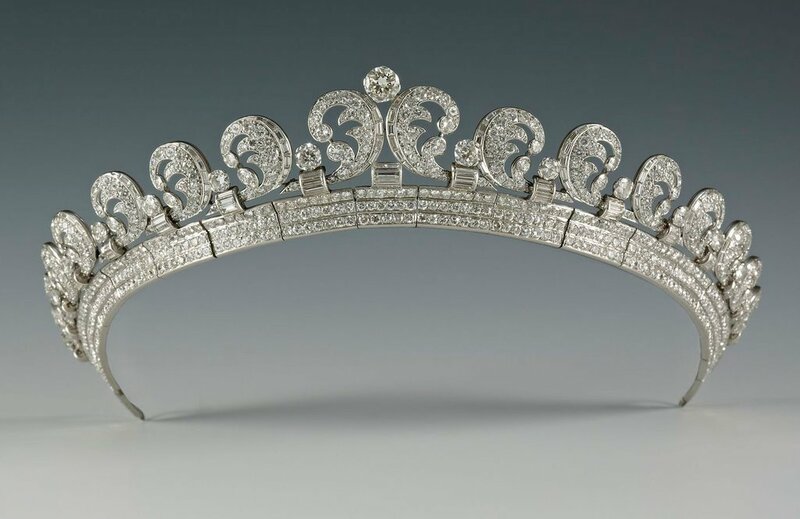 This tiara was given to a then Princess Elizabeth on her 18th birthday by her parents, King George VI and Queen Elizabeth. She has never been pictured wearing it because when she actually started wearing Tiaras she was was married and her more options to chose from. 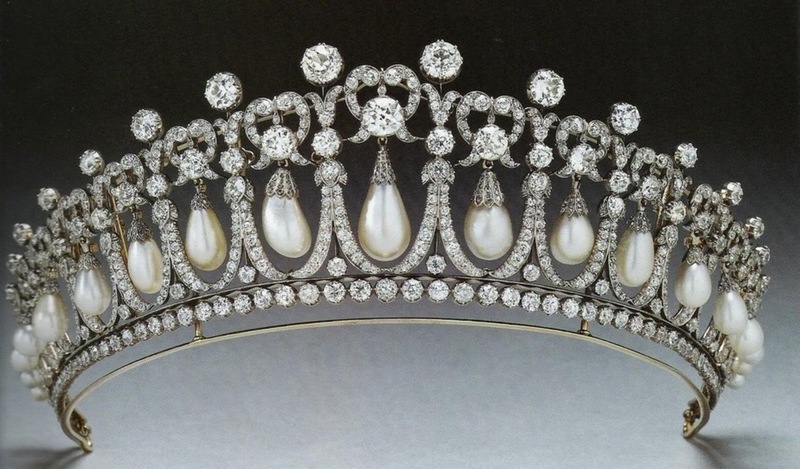 Princess Margaret and Princess Anne have both also used this beautiful Tiara. I can see this tiara being Princess Charlotte’s first and it would be a wonderful tribute to her parent’s love story. 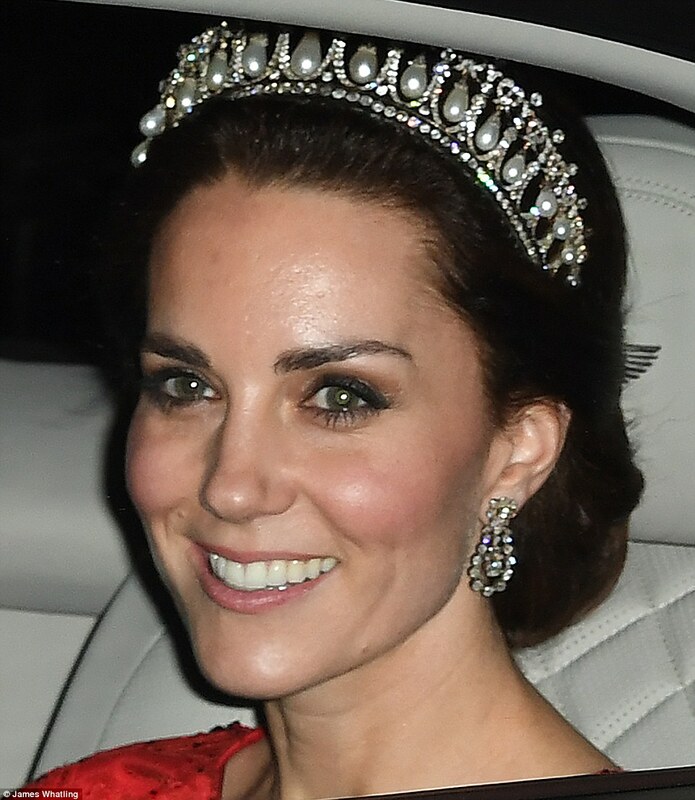 Kate wore this tiara in December 2013 for the annual Diplomatic Reception, her first tiara appearance since her wedding, and then again for The Chinese State Visit Banquet in 2015, her first state banquet. This tiara was originally Queen Elizabeth, The Queen Mother’s. 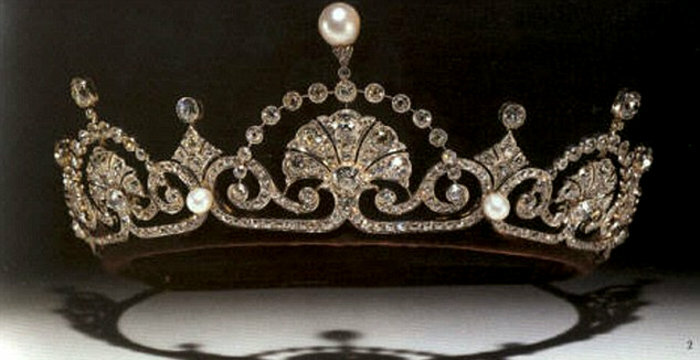 She loaned this tiara to Princess Margaret and Princess Margaret then loaned it to her Daughter-in-law for her wedding. 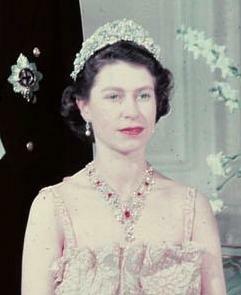 After Princess Margaret’s death in 2002, the tiara made its way back into the vault until 2013. 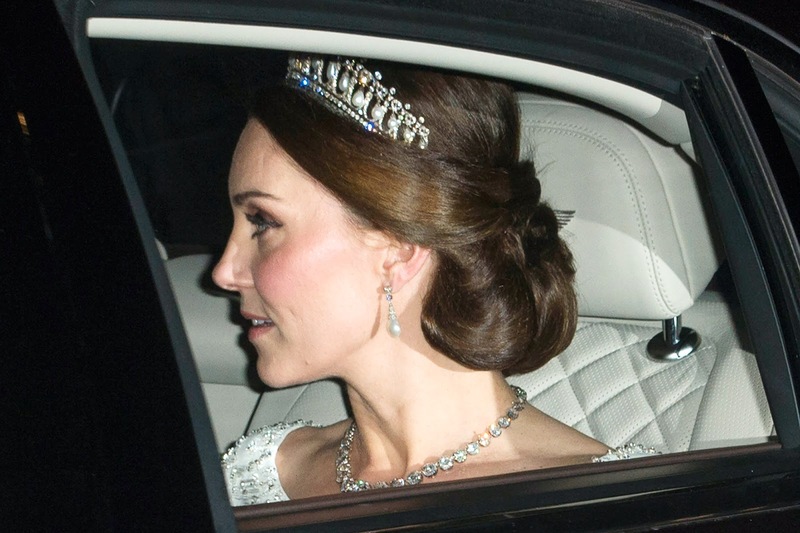 The Duchess of Cambridge has worn this this tiara 4 times already. She caught the world’s attention when she debuted it in December of 2015 and then wore it again in 2016 and twice in 2017. 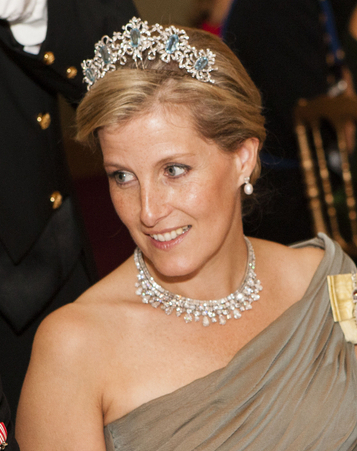 Diana, Princess of Wales made this tiara famous and people always claim it was her favorite but in fact she hated it. She always said it was to heavy. 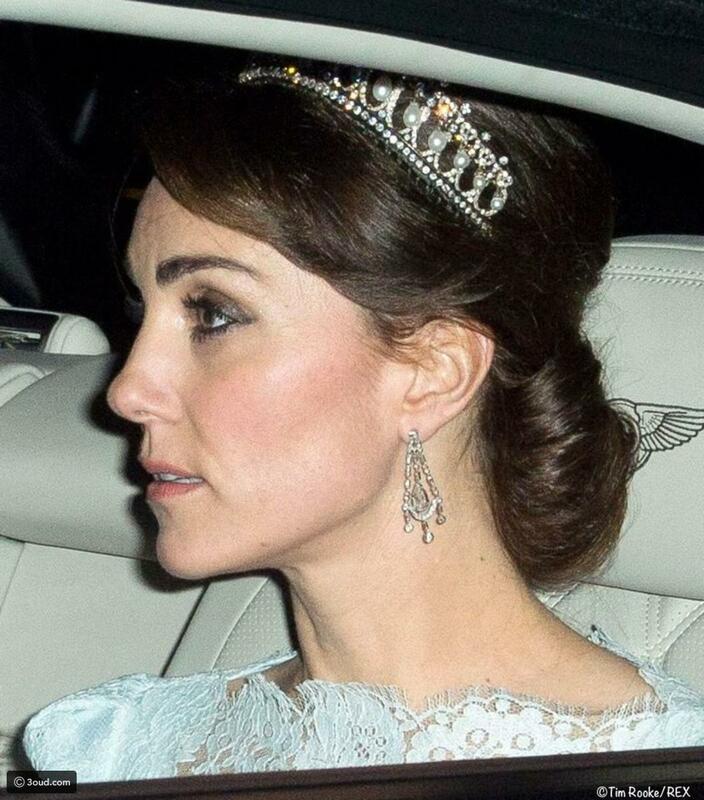 I find it very appropriate for Kate to wear this tiara as she is The Duchess of Cambridge not to mention the future Princess of Wales. 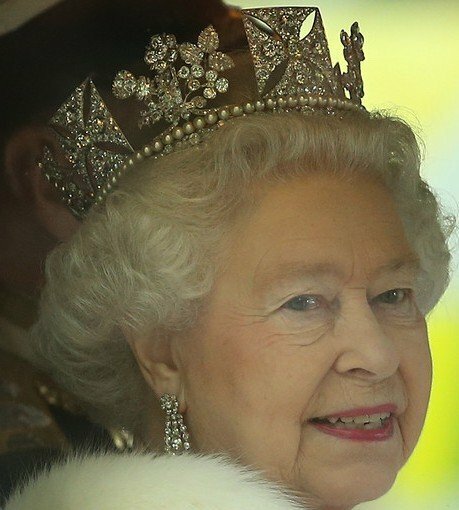 I suspect this is going to be her last tiara for awhile as she already has three and the other royal women also have three. But you never know anything could happen. 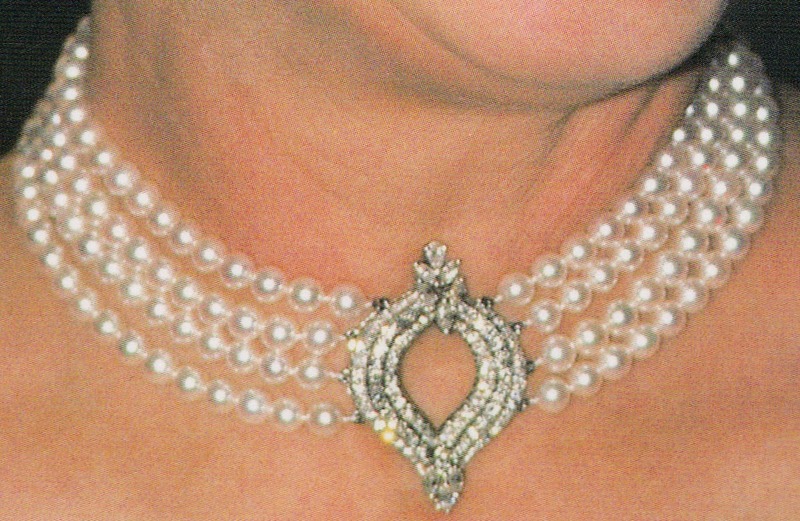 This collet necklace is one of the smaller ones that the queen has as she has many of these Collet necklaces. It can be seen on The Duchess of Cambridge in the photo above this paragraph. 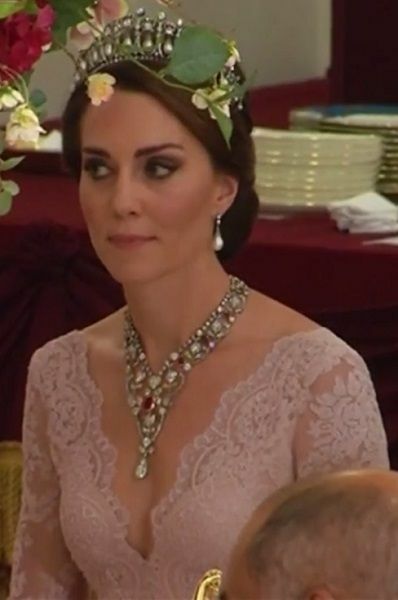 Kate was seen with this necklace for the first time last year at the dinner to Celebrate the 70th anniversary of Her Majesty and Prince Philip. 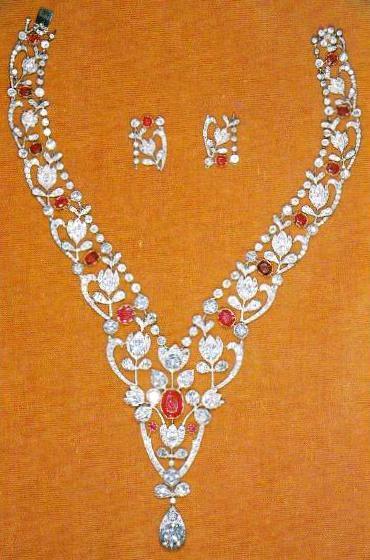 This necklace was given to the then Princess Elizabeth by The Nizam of Hyderabad along with a tiara and a brooch from the same necklace. 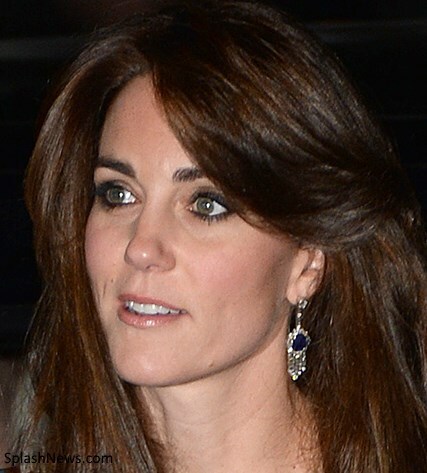 The Duchess of Cambridge debuted this necklace in October of 2013. 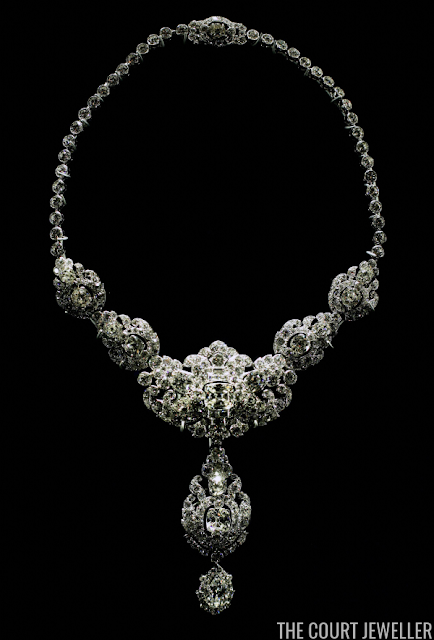 This necklace was one of The Queen’s wedding gifts from her parents, King George VI and Queen Elizabeth; the palace has referred to it as the King George VI and Queen Elizabeth Bandeau Necklace. 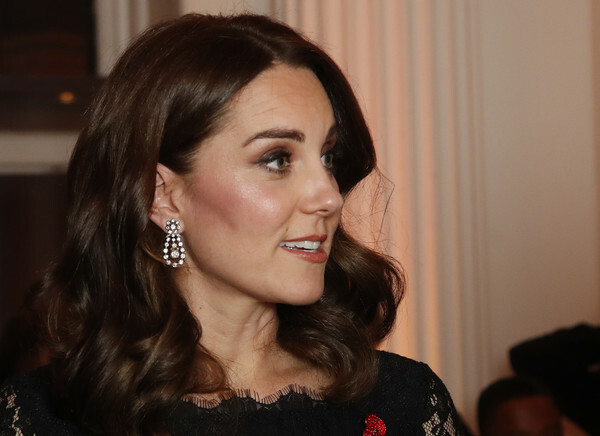 The Duchess of Cambridge debuted this stunning necklace at the Spanish State Visit in July 2017. 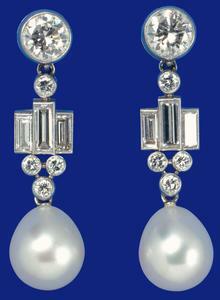 These beautiful earrings were made from Pearls that were given to The Queen and The Duke of Edinburgh as a wedding gift. It has also been loaned to Sophie, The Countess of Wessex and The Queen has also recently worn them. These were first seen on The Queen in 2012 and there is no additional information of their origin. Her Majesty first loaned these to The Duchess of Cambridge in 2016 and they seem to still be in her possession as she was last seen wearing them in November of 2017! These are part of The Queen’s vault but have never been loaned or worn publicly by any other member of The Royal Family. She first wore them in 2011 on her first royal tour after her marriage and has worn it many times since. These earrings were worn by the Queen on her Silver Jubilee in 1977. 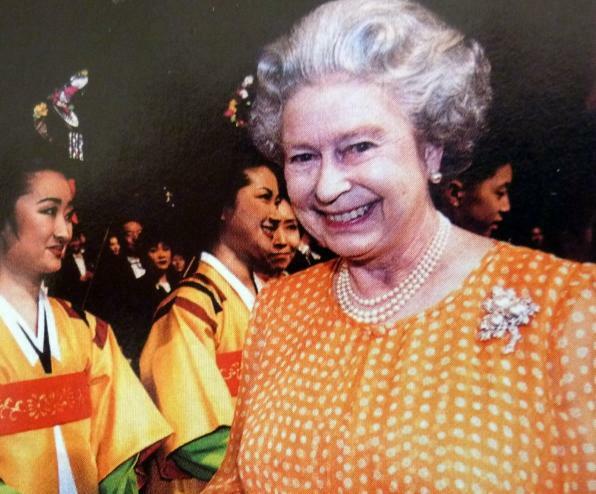 Her Majesty wore it once again in 1995 but doesn’t currently wear the earrings anymore. They were loaned to Sophie, The Countess of Wessex in 2012 along with them being loaned to The Duchess of Cambridge in 2016 during her tour of Canada and have been worn by her many times again including a trip to The Netherlands in 2016. 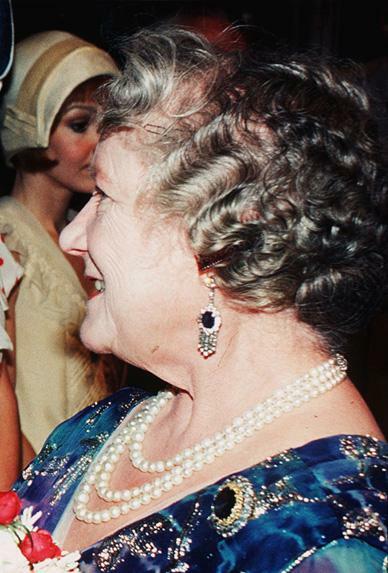 The Queen Mother loved all things Sapphire and she loved these earrings very much. 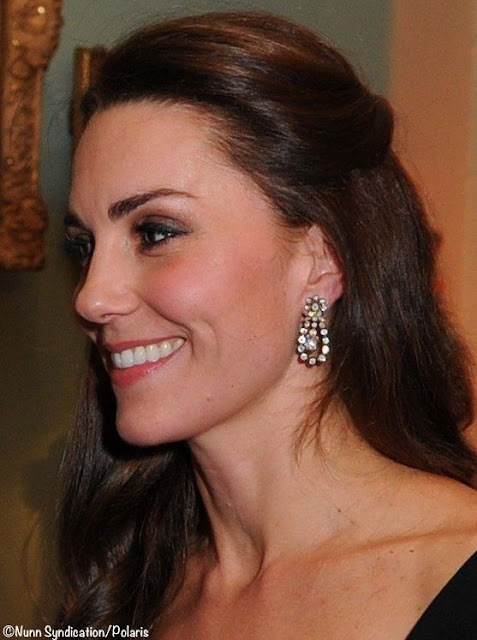 After her death, her jewelry was inherited by The Queen and these earrings were loaned to The Duchess of Cambridge in 2015. I believe she hasn’t worn them since. This brooch was owned by The Queen Mother and after her death The Queen inherited it. She has loaned it to The Duchess of Cornwall, for her first trip to Canada, and to The Duchess of Cambridge, for her first and second trip to Canada. 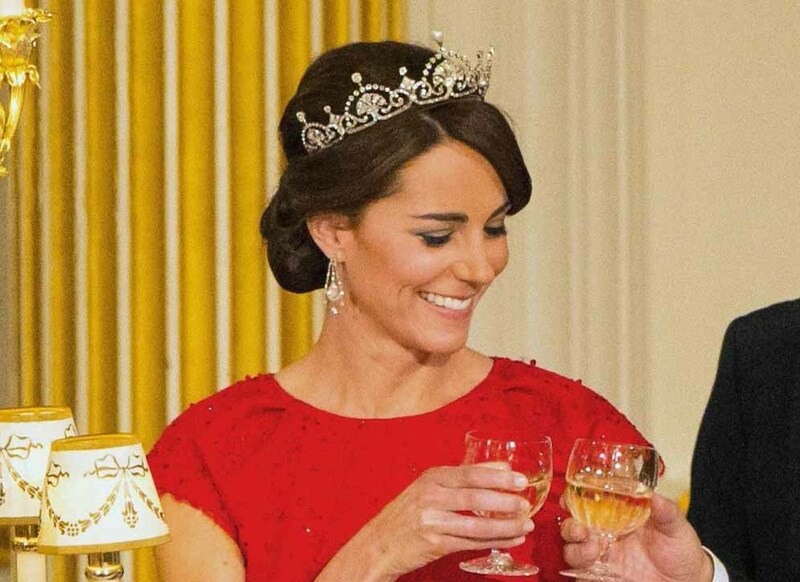 The Duchess of Cambridge wore it many times throughout her tours of Canada. 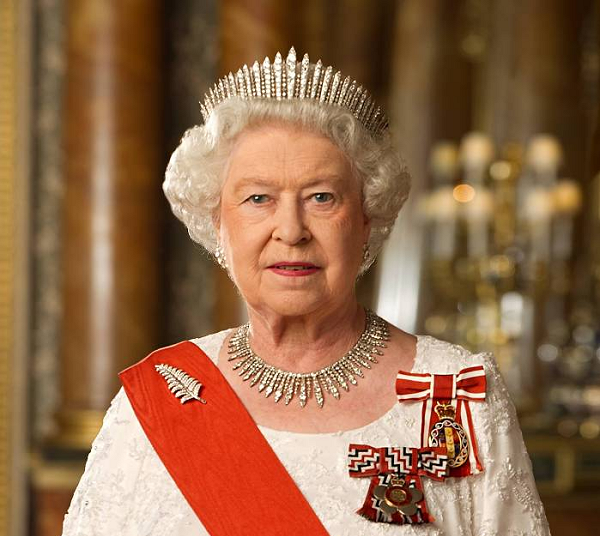 Her Majesty debuted this beautiful brooch during her Coronation Commonwealth Tour. She has worn it many times since then. 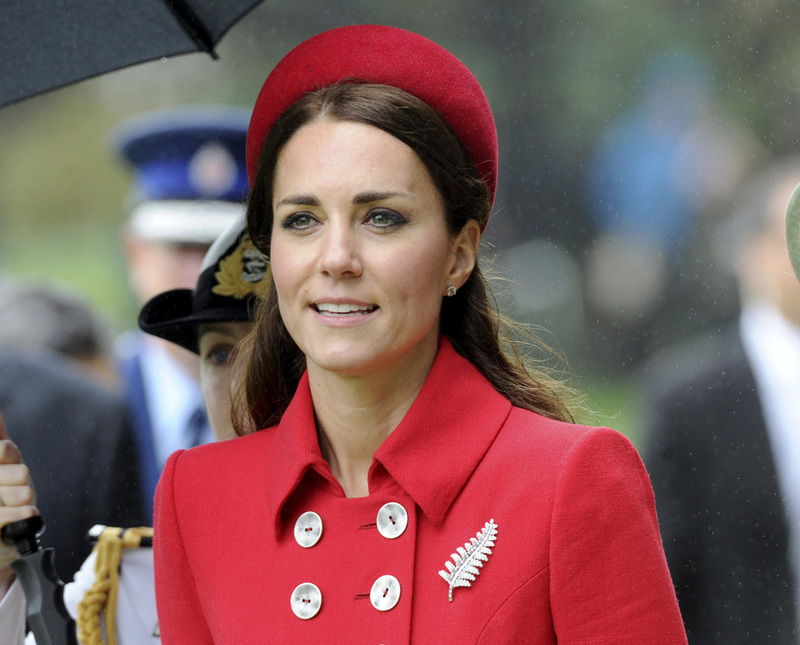 The Queen loaned this brooch for the FIRST time to The Duchess of Cambridge for her tour of New Zealand in 2014. 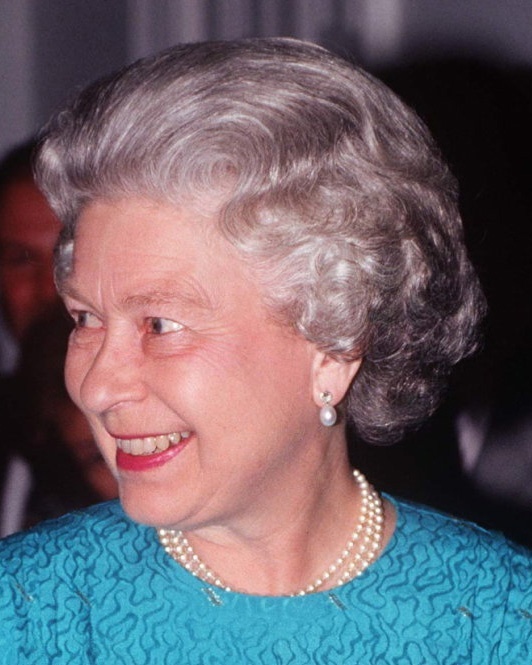 This brooch is one of the lesser known items of The Queen’s vault. She has on record only worn it once in 1999 during a state visit to Korea. 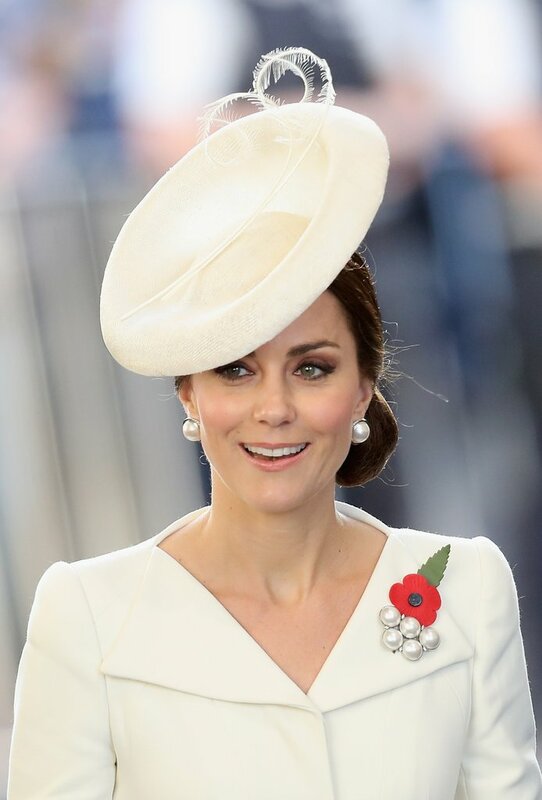 The Duchess of Cambridge debut this brooch in July of 2017 in Belgium as she was attending the commemoration of The Battle of Passchendaele. That is all for this week! I hope you all enjoyed it as it has been requested quite a bit and has been in my drafts for months! I got all my information from this wonderful blog! Check them out! Reminder: We are on Royal Baby Watch! Click here for live updates on anything and everything Baby Cambridge 3.0!